Our Florida beach wedding packages include everything you need. With all of our beach wedding packages, you can rest assured that every detail of your beach wedding ceremony will be covered. We have Florida beach wedding packages for elopements and for weddings with 50+ guests. Florida Beach Wedding packages are the most convenient way to plan your destination wedding. Not only are they the easiest, but you get the most beautiful beach wedding decor possible with our packages. If you are looking for every detail to be covered, our Distinctive Design beach wedding packages are an ideal choice. They are our most unique and exclusive beach Florida beach wedding packages. Florida Beach Wedding Packages are the ideal way to plan a destination wedding. With our beach wedding packages, there are no hidden fees or set-up charges. 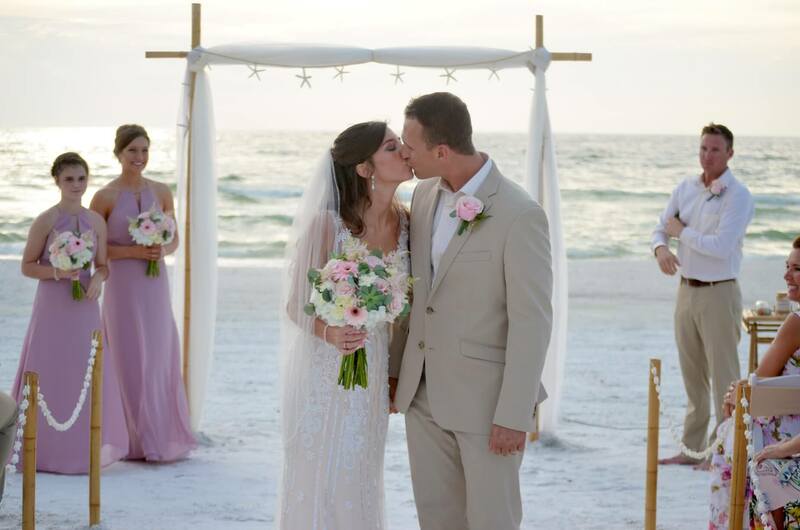 By choosing one of our Florida beach wedding packages,you know exactly how much your beach wedding ceremony is going to cost. Don’t let the idea of a beach wedding package scare you into thinking you won’t have the wedding decor you want. All of our packages have many different options for you to put your own twist on the set-up. You get to choose from our wide array of material colors for the bamboo canopy, your choice of aisle-way decor, the ceremony to be read, the music that will be played, the chair sash colors and so much more. All of our Florida Beach Wedding Packages are listed below. If you are looking for a sweet elopement ceremony, the Simply Florida Package would be an ideal choice for you. If you are looking for an intimate gathering with only close friends and family at an affordable rate, our Nautical Knot Beach wedding package is a great option. If you are having a larger group, want more decor choices and a full bamboo canopy, our Florida Destiny Package is everything you have been looking for. Our Distinctive Design Packages are our more classic beach wedding set-ups, with attention to minor details, a water and lemonade station for your guests, and elegant draping they are sure to make a statement. Why Florida Beach Wedding Packages? Florida Beach Wedding Packages keep you from being surprised when you show up at the beach for your wedding ceremony. You pick the package, and simply choose the colors. You know exactly what you are purchasing and how your beach wedding ceremony will look. This also allows you to work with one professional and reliable beach wedding company. Can you imagine trying to keep track of the officiant, photographer, rental company, music and more just for your “relaxing” beach wedding ceremony? Truly relax and let us take care of everything for you. One contact makes it simple for you to get your questions easily answered and prevents any miscommunications from happening. Florida Beach Wedding Packages are the easiest way to plan a destination wedding ceremony in Florida. If you are looking for truly unique wedding decor, check out our Distinctive Design Florida beach wedding packages. With our best bamboo, elegant draping, and attention to even the smallest details, your ceremony decor will be unforgettable. Our design team has made sure to include many modern designs, draping, colors, and flowers. If you are looking for a beachy style or more of a traditional and classic style, our Distinctive Design Florida beach wedding packages will have the perfect choice for you. Our Florida Simply beach wedding package is the ideal choice for an elopement. With a maximum of 6 guests, you can be surrounded by your closest friends and family. You can also choose to elope just the two of you. In the state of Florida, you will not need additional witnesses. We love the simplicity and romantic feel of an elopement with just the two of you. Our Elopement Florida beach wedding packages have the traditional design of the bamboo canopy in white or ivory with a starfish canopy topper, or you can upgrade to our two options for your bamboo canopy. The Natural Florida beach elopement and the Tropical Florida beach elopement if you are looking to really make a statement for your destination elopement. Our Florida Beach Wedding Packages are high-quality and designed to be elegant, unique and everything you have been dreaming of. Check out more of our beach weddings on our Facebook.